This is a collection of information about tattoos, tattooing, and tattoo artists and studios in Kenya. Submit addresses and webpages of tattoo artists in this country as well as your experiences of being tattooed in Kenya. Are you looking for a tattoo in Kenya? Did you receive a tattoo in this country and would like to share your story? Would you like to recommend a tattoo studio in Kenya? Photo from Tattooing in Kenya. Are you a tattoo artist from Kenya and would like to tell us about your art or submit photos of your work? Then submit your links, information, and comments below or email Wade at Vagabondsong [at] gmail.com to have photos of your tattoos featured here. 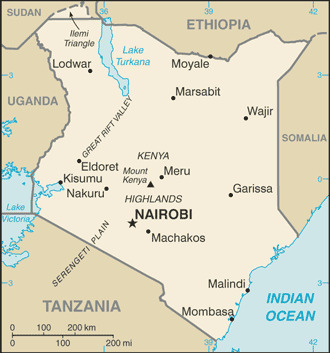 Find more information about Kenya on the Kenya Travel Guide. The Goth Shop which is located on the 1st Floor of the Mall, Westlands, in Nairobi has a really skilled tattooist and body piercer.You should definitely check it out.Plus,you can do some shopping of some really cool rock and gothic merchandise-the only shop in Kenya that sells gothic,rock and punk merchandise. Thanks for this suggestion. When I get to Nairobi I will certainly stop into this tattoo shop. talk to me on tattoozaoz@gmail.com or call 0737-091013.
need to be introduced to sort of tatoo art lesson with the need of having drawing skills. Looking for a tattoo place in Mombasa, Kenya anyone with any idea on where I could get onne?? im a tattooist from Diani beach,i’ve been tattooing for a while.i recently working on finishing my studio. You may want to include the contact info for your studio here. I have absolutely not idea that anything like this even exists — unless you are talking about those tattoos that you need to view with a data phone. hey guys am a professional tattoo artist in Eldoret and you are welcome to check out my works. Yeah that’s true ,i just say no to psychos nowadays. I saw the tattoo Newton did on you. It’s not bad. It is obvious that you know very little about tattooing (calling a tattoo artist an “inker” shows this clearly), and your comment should not be taken seriously. I’m planin 2 come there in nairobi..and i want a nice tatoo on me who cangive me the adress and when i’ll come in march,i put a tatoo from kenya coz here in Rwanda there is not the specialist for that ..
Hi, I reside in Mombasa and i am looking for a professional tattoist,where would i get one? I’m a Canadian tattoo artist who has set up shop in Kampala, Uganda and I’m kinda hopin U might lead me to some suppliers in Kenya. So far only ones I’ve found are in SA and they don’t answer their phone or their e-mails.